Toyo Ito & Associates, Sendai Mediatheque, 2001, Sendai, Miyagi, Japan. Photo: Tomio Ohashi. RENOWNED ARCHITECT TOYO ITO, winner of this year’s Pritzker Prize, has spent his career exploring the subtle yet vital connections between the physical and ephemeral qualities of space. If his early designs were marked by a pioneering interest in the effects of new media and digital technology on the urban environment, his more recent work has investigated architecture’s capacity to cultivate modes of social interaction and produce vibrant public spaces. Indeed, the buildings he has produced over the course of more than four decades are praised equally for their formal inventiveness, structural innovation, and programmatic originality. His recent commissions have included major public projects at a range of scales, among them the Sendai Mediatheque, in Miyagi, Japan, completed in 2001; the 2002 Serpentine Pavilion in London; the 2006 Meiso no Mori Municipal Funeral Hall in Kakamigaharashi, Gifu, Japan; and the Taichung Metropolitan OperaHouse in Taiwan, currently under construction. Building frequently in earthquake-prone Japan, Ito has also long been accustomed to adapting his designs to environmental risk. But the devastation of northern Japan by the 2011 earthquake and tsunami led him to reconsider, with renewed urgency, architecture’s role in planning for and responding to environmental disasters. Here, Ito speaks with Artforum senior editor JULIAN ROSE about the relationship between design, the natural environment, and systemic crisis. JULIAN ROSE: The catastrophe at the Fukushima nuclear plant in 2011 was not a natural disaster, strictly speaking, but neither was it entirely man-made; it was a terrifyingly destructive interaction between the built and natural environments, in which the earthquake and tsunami critically exacerbated weaknesses in the plant’s design and construction. It seems that as our infrastructures and technologies get more complex, they also create more possibilities for catastrophic failure. Have we reached a point at which our infrastructures do not manage environmental risks but actually amplify them? What lessons does an event such as Fukushima offer for rethinking the relationship between infrastructureor perhaps architecture and urban planning more generallyand the natural environment? TOYO ITO: Well, as you mentioned, Fukushima did not have a single cause, whether natural or man-made. But the very idea of a division between the natural and man-made is false, and events like this one are caused in part by our attempts to separate the two. Our way of life is still based in twentieth-century ideas, specifically a modernist philosophy that assumes we can use science and technology to conquer nature. So we try to isolate ourselves from nature; our cities are completely segregated from the environment. For instance, in 2011, many parts of the Japanese coast were protected by huge retaining walls that were built to withstand a tsunami. The nuclear plant itself was supposedly designed to resist even a massive earthquake. Yet the walls were easily broken and the plant was irreparably damaged. The catastrophe showed that you cannot isolate a building or a city from the environment. That kind of modernist thinking has reached its limit. But before Japan’s modernization, we used to think of ourselves as part of nature, and also of architecture as part of nature. We understood humans, architecture, and the environment as part of one interrelated system. For example, traditional Japanese wooden buildings featured large open verandas (engawa) sheltered by deep eaves, and their entries were designed so that the exterior extended into the house in the form of a compacted earth floor (doma): These techniques made indoor and outdoor space continuous. And of course, timber construction was inherently adaptable to the forces of nature because it could be easily repaired or rebuilt after an earthquake. I’m not suggesting we can simply return to the past, but to get beyond the limitations of modernism, we probably need to look for new approaches, some of which might be suggested by our own culture and history. JR: We certainly can’t return to normal. Perhaps a kind of postcrisis condition has become the new normal. One obvious manifestation of this condition in architecture is so-called relief housing, which is ostensibly deployed to provide temporary aid immediately following a disaster, but often ends up sheltering people for years. We saw that in the US, when Hurricane Katrina destroyed vast amounts of housing and people spent five or six years in government-provided trailers, and unfortunately a similar thing seems to be happening now in Japan after the 2011 earthquake and tsunami. What role can the architect play under these conditions of almost permanent crisis? 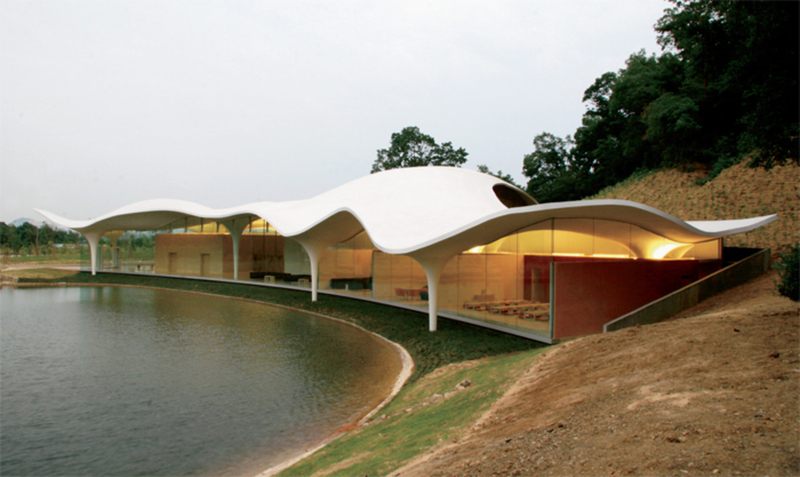 Toyo Ito & Associates, Meiso no Mori Municipal Funeral Hall, 2006, Kakamigahara-shi, Gifu, Japan. TI: Architects tend to think of themselves as artists or inventors, and they prioritize personal expression. But personal expression is not our most powerful tool for changing society. In the face of today’s crises, the architect must become a negotiator. This means building a dialogue between all of the many people who use or inhabit architecture. Rather than designing structures, the architect should be designing this process of exchange and communication. Take my Home-for-All project, for example, which responded to the housing problem you mentioned. The 2011 tsunami displaced an enormous number of people, and even now, over two years later, there are still about 150,000 refugees living in temporary houses provided by the government. Ironically, the atmosphere created by the state’s temporary housing is very similar to the atmosphere of the modern city, because both are based on the same kinds of technology and thinking. The relief housing is designed to provide shelter and privacy for the individual, but not to foster social interaction. The basic problem with these buildings is that each unit is very closed, with few windows and narrow doors, almost sealed off from the outside. Worse, despite their very small footprint, the interiors are subdivided into the same number of rooms you would find in a typical modern Japanese house, which results in a series of claustrophobic, isolated spaces. There is really no warmth or atmosphere inside. In a sense, this type of housing is like a mirror that reflects the worst aspects of modernism. So Home-for-All is intended as a little bit of antimodernization, designed with a fundamentally different approach. In the government’s temporary houses, the subdivision of space separates all domestic programs into individual rooms, a typically modern technique of division according to function. But the Home-for-All buildings create a different sense of place, more like that of a house in premodern Japan. They have northern and southern exposure and good natural light, which gives you a sense of contact with your surroundings. When possible, they use local materials; the one in Rikuzentakata, for example, was built with logs from cedar trees that had been damaged in the tsunami. And all the functions are gathered in one room: The living spaces are continuous with the kitchen and the hearth. The buildings don’t have bedrooms, because they are not intended for a single family to inhabit, but placing one of them within a complex of temporary houses in the communities affected by the earthquake and tsunami offers a homelike atmosphere for everyone. By offering this kind of informal shared space, I am trying to establish conditions that will increase meaningful interaction between residents and encourage the development of new relationships. That is what I mean by designing a processI want to connect people through the design. My goal is not to reestablish the way of life that existed before the tsunami hit; it is to create a new social life for the next generation that will be growing up in the aftermath of the catastrophe. JR: At the same time that your architecture responds to natural disasters, it must also anticipate them. This is particularly true of earthquakes, given their frequency in Japan. Seismic requirements are very strict for all Japanese architecture, and your buildings in particular incorporate extremely sophisticated structural systems to mitigate the risk of earthquake damage, often by emphasizing structural flexibility. In the Sendai Mediatheque, for example, you and your engineer invented a system of bundled steel tubes to replace traditional columns in providing vertical support, and the building was famously able to survive the 2011 earthquake with very little damage. How does the constant awareness of risk affect your design process? TI: We started to design the Sendai Mediatheque in 1995, the year of the Kobe earthquake. We do have a lot of earthquakes in Japan, but the magnitude and amount of damage caused by that one in particular had a major influence on building design throughout the country. And, in fact, when the 2011 earthquake hit Sendai, very few buildings collapsed, thanks to changes that were made in response to Kobe. But one of the most important lessons I took from the 1995 earthquake was that it helped me understand the crucial role public architecture plays in the response to natural disasters. From that point on, I have thought as much about the social function the building will fulfill after a natural disaster as about how its structure will respond to an earthquake itself. In a catastrophe, a public building really needs to remain open, so that people can gather there. When the earthquake hits, people should know that they can immediately go to a public building to receive and exchange information about what is happening. JR: For you, then, access to information is perhaps just as important as providing physical shelter. And your buildings have consistently engaged new information technology. That’s what the Sendai Mediatheque is so well known forreinventing the traditional library and museum programs by providing spaces in which visitors can engage with a wide range of mediawhere they can read books, watch films, edit their own audio and video recordings. But how do you integrate what are essentially immaterial systems into a design that must also meet the very intense physical demands of withstanding an earthquake? Toyo Ito and Maki Onishi, Home-for-All for Children in Higashi Matsushima, 2013, Miyagi, Japan. Photo: Iwan Baan. TI: Well, offering access to information is not simply a technological problem. It also requires a physical place for exchange, as I’ve described. 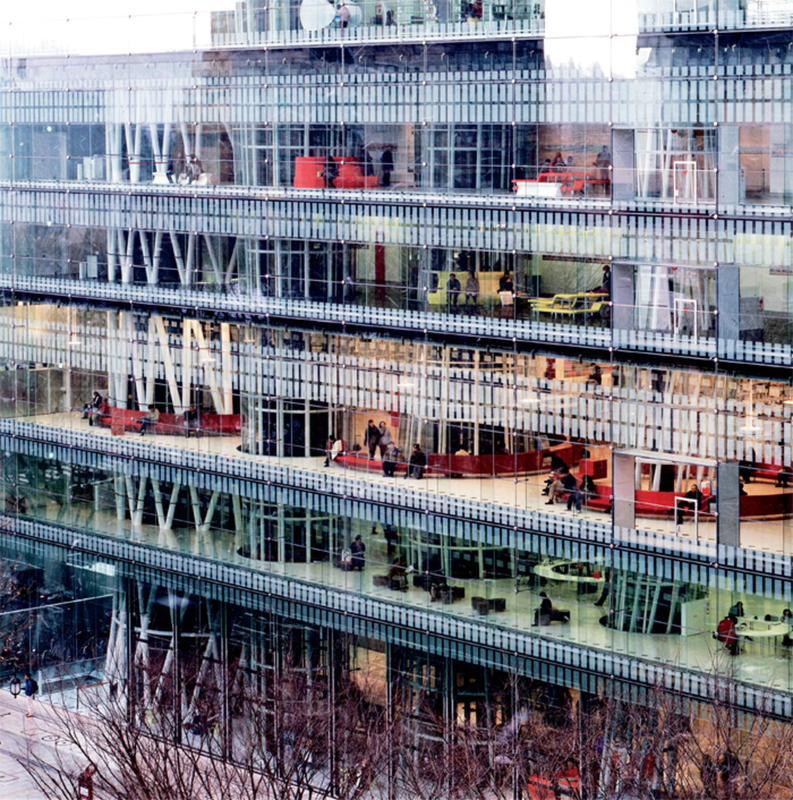 When I designed the Sendai building, I used the metaphor of water to guide my approach. The metaphor had two meanings for me. In one sense, I was thinking of water as, basically, the Internet: the fluid network that links the building to the rest of the world. At the same time, I was thinking about water in a more literal sense: Before modernization, the entire world was connected by water; water was the network for all transportation and communication. I wanted to incorporate both of these modes of exchange into the architecture, because balancing these two types of connectionone virtual, one physicalis probably one of the most important considerations for the architecture of the coming century. JR: And maybe that’s why public space is so important to your work: You seem to suggest that public spacewhere physical as well as ephemeral connections are madeis more crucial than ever today, as we at once recover from and plan for crises like the one at Fukushima. But ironically, public space seems to be disappearing from our cities. Many of the spaces that might be labeled public by a developer or architect are actually leftover spaces, semiprivate zones that happen to be attached to private programsbuilding lobbies are a perfect example. Or they are essentially commercial or “mixed-use” spaces, as if consumption is the only remaining form of public life. How, then, does the Sendai Media­theque specifically function as public space? And do you think the kind of small-scale community architecture we see in the Home-for-All project could work in a large city, maybe even becoming a new model for urban social space? TI: It’s true that the typical architectural project is driven primarily by business considerations. But new economic conditions can emerge in the aftermath of a catastrophe. While working on the Home-for-All project, I noticed that the circumstances of both production and consumption were changing in the areas affected by the earthquake or tsunami. Today, production and consumption tend to be completely separated. But I have seen people begin to bridge these processes, operating between them. Before the earthquake, for example, the agricultural and fishing industries were controlled by large cooperatives, who bought from individual producers and then resold their goods. Because this system made producers and consumers invisible to each other, it was not always clear to the customers what factors were setting prices, nor was it clear to the farmers or fishermen who was actually buying their products in the end. In some communities, producers are now contracting with consumers directly through the Internet. So the consumer can understand more clearly where a product comes from, and the producer can see customer demand firsthand. This kind of smaller-scale, more direct interaction is one of the positive effects of having a public space where people can engage in conversation, and where ideas like this can take shape. I would call the people who are making these connections superindividuals, because of the way they are able to bring a community together. And their impact is not only economic, because they can apply the same kinds of community-based approaches to social issues. In the end, public space is not a specific program in itself. It is a condition for many possibilities. For example, the Sendai Mediatheque was actually slightly damaged by the earthquake in 2011, and it briefly closed. But we made an effort to reopen it as soon as possible, because it functions as a kind of cultural refuge in the city. Most people who use the building are not going there just to read a book or watch a film; many of them probably do not have any definite purpose at all. You might go to a concert hall specifically to listen to music, but the Mediatheque does not work that way. It is not a place where people go to do a particular thing. They go just to be part of the community in the building. Public architecture should serve as the basic unit of communal space and provide the essential idea of public life. 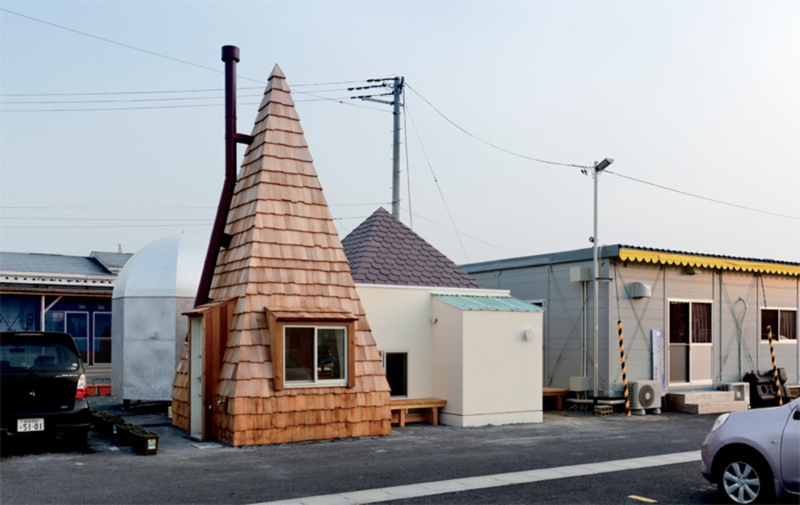 And this is not about the size of the buildingthe Home-for-All project is small, but the ways in which it brings people together, and the results of this exchange, are the same as in the Sendai Mediatheque. These structures might offer not only a new community architecture, but alsoif on a small scalea new kind of society.